Visitors from a vast vacationland follow their own hysteria to a perceived presence which is hauntingly housed throughout the shadowy streets of a storied city. Wearing creative Halloween costumes countless hordes are drawn into an anticipation abyss, searching for lurking manifesting macabre and some semblance of sensory validation. 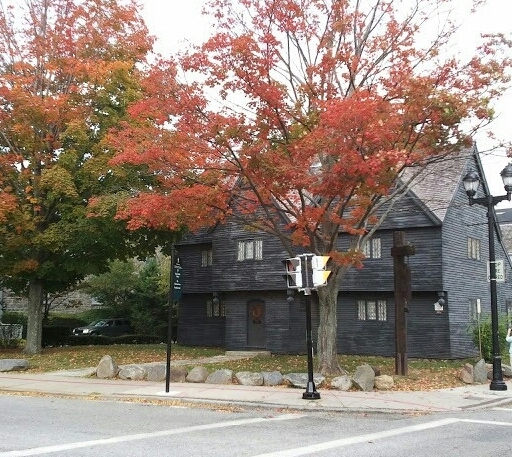 (Photo: Edward Roads -The Witch House in Salem). 🙂 I was born in Salem. I can just picture it! Good job. That is so very true. Thank You Kimberly. Maybe it’s time for a fresh coat of paint on that house! A cheery yellow? A stately red? Funny you should say that, they are painting it this week… Thank you so much. I wonder what color. Now it looks like Sherwin-Williams Spooky House Exterior Gray. Good point about the candy-quality wordsforjp. I like this one; image and the tale. This house looks cool but I guess at night, that could change. Oh I love this photo! I have a similar one from my visit there a few years ago. Every garden and alley in Salem has a story and to spend All Hallows there would be perfect. Thank You so much Karin. I really appreciate your wonderful comments. You had me at “Visitors from a vast vacationland” 🙂 Love alliteration! It must be starting to get crazy there! It’s definitely getting crazy here! Thank You so very much. Reading through your posts. I love your all pictures and the two sentence concept! I nominated you for the One Lovely Blog Award. I love the two sentence structure. Great photos too! Thank You so very much. I honestly appreciate that. Your short poetic messages are very beautiful , I have noticed that poetry is a outlet for a passionate soul! Thank You so much Caro. It’s a great photo. How old id the house? What a fabulous looking building and I should imagine it has a real presence about it. Magical words and image. Thanks for sharing.